Desserts, we all love them. It’s no accident that desserts and other sweet things are everybody’s favorite recipes. Sweets, desserts and cakes are my downfall. I find it very difficult to curb my sweet tooth. But all is not lost. It IS possible to lighten most desserts. In fact many of your favorite desserts can be easily modified so that they contain only a fraction of the fat, sugar and calories of the original. Obviously some dessert recipes are easier to lighten than others. But even cream based desserts such as panna cotta and cream cheese desserts can be lightened by making simple substitutions. Fruit desserts, at first glance, would appear to be the healthy option. But cover them with a rich pastry or drown them in sugar syrup and obviously they start to lose that healthiness. I believe that food is meant to be enjoyed. Food brings families together and is the centerpiece of most of our holiday celebrations. Nothing caps off a memorable meal better than a delicious sweet. But they don’t have to be calorie laden diet traps. Our healthy dessert recipes will show you a healthier way of enjoying them. Rice custards or puddings are a comforting winter warmer. Make using skim milk or evaporated milk as a lighter alternative. Fruit crumbles are a simple and easy way to use fresh fruit and can be topped with a healthy crumble topping made out of rolled oats and nuts. Do away with flaky, puff and short pastry and make pies with filo pastry instead or use graham cracker crust. Poach pears in natural fruit juice rather than sugary syrups. The natural sweetness will enhance the delicate flavor of the pears. Use yogurt as the base for mousse, panna cotta or parfaits. Just add your favorite flavorings and fruit. When making apple pie or baked apples, use maple syrup or dried fruit such as raisins, currants or chopped dates as a sweetener. Plain, fresh fruit is nature’s natural dessert. 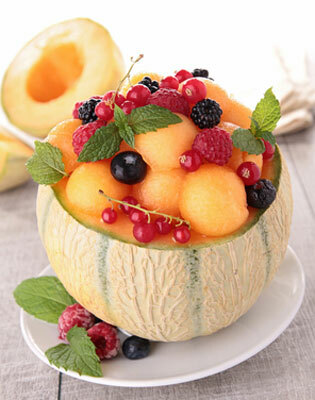 Fruit contains natural sugars and doesn’t need heavy, sugary syrups added. A lightly spiced syrup will give you all the flavor you need. Fresh fruit is best, then frozen. If the only alternative is the canned variety, look for fruit packed in its own juices. Don’t forget the humble vegetable. Sweet starchy vegetables such as sweet potatoes, winter squash, pumpkin and carrots are chock-full of nutrients and fiber and make the most wonderful desserts. Make a berry puree with fresh strawberries and raspberries to pour over ice cream or panna cotta. Core green apples and fill with dried fruits and slivered almonds. Bake with apple juice until tender. Serve with ricotta and cinnamon. Flavor low-fat vanilla fromage frais or yogurt with passionfruit pulp or raspberry puree. Use biscotti for dipping. Alternatively, layer the yogurt mixture with savoiardi biscuits and allow to set in the fridge. Then serve topped with fresh fruit. ¾ teaspoon coconut extract with 1 tablespoon toasted flaked coconut. When making chocolate desserts, use cocoa powder in place of solid baking chocolate. Cocoa is simply chocolate minus the cocoa butter. To enhance the flavor add strong brewed coffee or instant coffee granules. When substituting full-fat milk you have several options. Buttermilk has much less fat, but has a distinctive taste and works better with baked goods. Often skim milk will work just fine. Evaporated milk does a great job replacing cream or whole milk. For a thicker texture add a tablespoon of cornstarch for every cup of milk. Unfortunately it’s not always a matter of simply swapping a full fat product with its low-fat version. This is particularly the case with cheesecakes. Fat-free cream cheese does not work well in cheesecakes. When you try and add liquid to the beaten cream cheese, a funny thing happens, it curdles and starts to look scrambled. It's much better to use light cream cheese. Fat-free ricotta becomes too runny when baked. Adding a tablespoon of all-purpose flour for each 15 ounce container of fat-free ricotta seems to prevent this.